Now players can experience the fantastic excitement of dropping bombs from WW1-type blimps and bi-planes on numbered targets filling a canyon below. 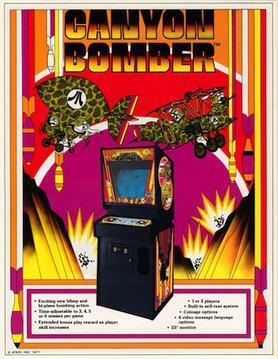 As the aircraft fly over the canyon at random speeds, players press a simple push-button control to bomb as many targets as possible without missing. Skill and strategy in judging just the right bomb release time and angle of bomb descent to hit the remaining targets determine the amount of points achieved.